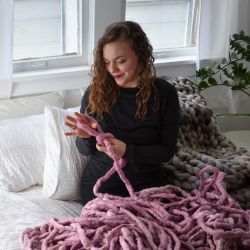 "We specialize in super chunky knit yarns and blankets as well as luxury handmade rugs. Everything is handmade in Denver from merino wool and alpaca fleece"
My name is Camille. I started my career as a fashion buyer in London for an established British brand. Working in Soho, I was surrounded every day by the most exquisite knitted garments in the fashion world. I have since moved back to the USA, and started Broadwick Fibers because working with yarn is my passion. My aim is to transform premium fibers, usually reserved for clothing, into luxurious, handcrafted blankets, throws and scarves. I use Silk, Merino, Alpaca, Mohair and Cashmere, so watch this space for some fabulous new finds.